I am super excited about today's outfit/ DIY!!!! 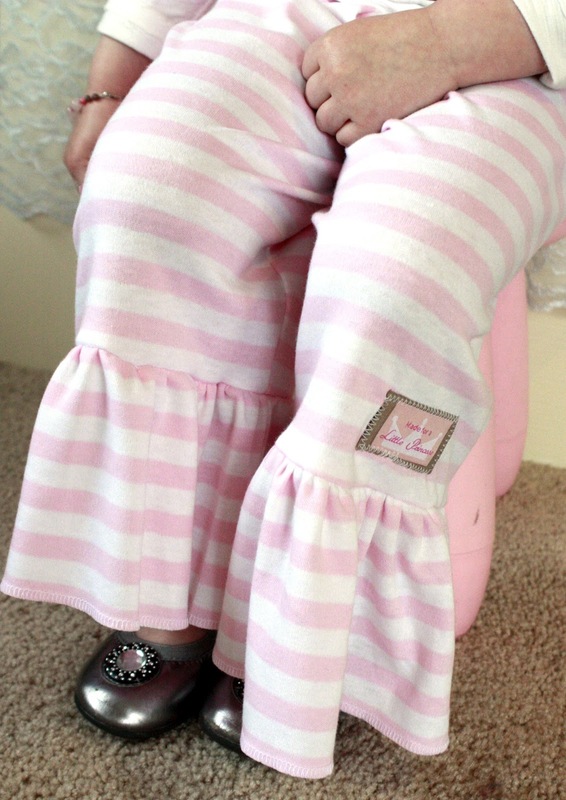 I was recently invited to a Matilda Jane trunk show....while I was perusing their website and making a wish list I came across these adorable Strawberry Lemonade pants only exclusively available(whatever that means) and I remembered the pink stripe knit fabric I have been holding onto since I scored about a yard of it at an estate sale this summer for 50cents! I have not made an actual garment from knit fabric but for 50 cents how can you go wrong?! I am however fortunate enough to be the owner of a killer craigs list deal serger(not to be confused with craigs list killer;) so really why wasn't I sewing knits long before today!!! SO I set out with my basic pant pattern my .50 cent knit fabric and my handy serger and I did it!! Complete with funky little brown label! Matilda Janes website is a never ending inspirational site. I still plan to attend said party and maybe purchase some adorable pricy things for the little lady ;) other wise I will be making my own version of their ruffled pants! So once again before you buy why not DIY! Tips for sewing knits use a serger!! If not pin like crazy twice what you would normally pin. I had no issues with the fabric what so ever :O shocked still! Can you please share the pattern? You did an amazing job!! !